As we near the end of April, camp is less than two months away for our first session and eight week campers. Its time to start gearing up for the summer. Over the past few weeks we've emailed all of our families the info they need to help prepare for the summer. For the most part, that means forms, forms and more forms. Our "Preparing for Camp" page has lots of useful information to help you get ready for the summer. On this page you can find links for ordering name labels for all of your clothing and other camp gear. When I talked to one of the reps from Mabel's Labels at the ACA Conference exhibit hall they swore that their sticky labels would not come off of cook kits in the dish washer... I'll believe it when I see it. We've posted an updated equipment list, too. Aside from the spiffy redesign, we've made some minor alterations, too. Make sure you take a look over it and if you have any questions, please shoot us an email or give us a call. We want to make sure all campers come to camp with the right gear, especially for their cabin camping trips. We also have an equipment list for our staff. There are many great places for you to make your purchases for the summer. We encourage you to shop around and find the best deals. Uncle Dan's, a camping and apparel store (that has several locations in the Chicago area) has provided a 10% discount for North Star families. This is an ongoing promotion, so if you go into one of their stores, mention that you're from North Star for the discount. You can also get the discount online by entering "northstar" in the coupon code box when you check out. Online shoppers will also receive free shipping. For our Pine Manor campers going on the Canadian (current 1st session/8 week 9th graders), we have a specific equipment list. That equipment list can be found on the Campintouch system. If you have any questions about specific gear or items for the trip, don't hesitate to call or email. We want to make sure that everyone has the stuff they need, but also don't break the bank in the process! The American Camp Association has launched its new campaign "Because of Camp..." As part of the public relations campaign, they are airing commercials on TV and the Web, and there are billboards and posters all over the country. Leb helped get this idea off of the ground and North Star alum Paul Adelstein is featured! Listen to former Olympians, actors, actresses, world leaders, and global thinkers share how camp affected their lives. Then Tell Us Your "Because of Camp..."
As you may have heard, Leb and Sue were honored this past weekend by SCOPE Midwest at their 2nd annual benefit dinner this past Friday. Look for a blog entry later this week about the event and all the great members of the NSC community who came out to support Leb and Sue and to help send underprivileged kids to camp. The event was held in Chicago, so that gave us an opportunity to spend some time to catch up with a meeting Friday afternoon before the event. As we tried to coordinate when we'd meet on Friday, I gave Leb a few different options, with option C being at 1:20 at Wrigley Field, which happened to be the start of the Cubs-Astros game. Leb liked the idea and told Andy to go ahead and buy the tickets. As luck would have it, there were good tickets available and we landed four seats eleven rows behind the Astros' dugout. Leb also decided that we'd surprise Sue, so Andy and I promised that we wouldn't say anything. We told Sue that we were going to meet at their hotel, talk for a little while, and then meet up with NSC Alum Jake Segil for lunch. The weather in Chicago was gorgeous on Friday and as we walked towards the El (the Chicago subway system), Sue didn't know that we'd instead be spending the afternoon at Wrigley Field. Even as we were surrounded by people clad in Cubs jerseys on the El, Sue didn't suspect anything. 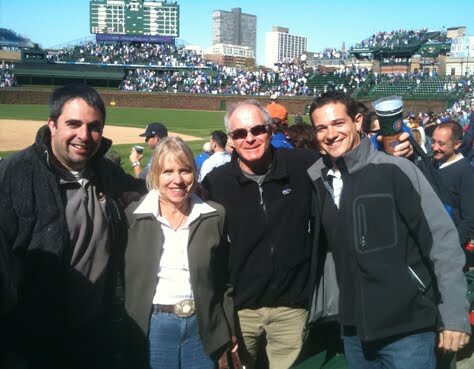 Leb had been to Wrigley Field once before and it was Sue's first visit, so it was a great surprise when we showed Sue the four tickets for the game. We'll be sure to tell you all during the summer how we actually pulled off the surprise. Sue loved the Wrigley game day atmosphere and the old time feel of the ballpark. We shouldn't leave out the fact that the Cubs beat the Astros 7-2. "When Matthew Carroll decided to work as a counselor at a traditional American summer camp in upstate New York, he never realized that his decision would quickly turn into a journey of discovery. Having just graduated from a small university in his native country of Ireland only one week earlier, he thought a couple of months working in a camp would assist in his pursuit of avoiding the real world. Instead, his experience made him realize how much he – and more importantly the world – could learn from summer camp." Read the Rest of the Article on STLtoday.com. A quick note thanking everyone for their participation in the 2010 edition of March Madness. We easily broke our goal of 100 entries, with over 140... that is if we count the few people who forgot to enter their picks. Nine people correctly picked Duke winning it all, while, like the rest of the country, Kansas and Kentucky were much more popular choices. Leb made a late push and finished in the top ten as he was amongst those who choose Duke (Leb's alma mater) winning it all. This year's winner is Alex Sharrin. Alex is one of our counselors, and amongst the other things that he instructs, he is on the basketball project. In this year of basketball insanity, he correctly choose three of the final four entrants (his only misstep was choosing Syracuse coming out of the West). Congrats Alex! Also, thanks to those you who who also participated in Camp For All Kids' March Madness, which helped raise money for the scholarship fund. As the calendar turns to April 1st, it becomes clear that camp is just around the corner. Leb and Sue typically head up to North Star in the first week or so of May, so that leaves us just over a month before our office relocates to Hayward. We're in full staffing mode right now, but to be honest, we're at the tail end of our hiring season. There have been years when we headed into April needing a dozen or more counselors, a few trip leaders as well as kitchen and maintenance staff. As of the writing of this blog entry, we're looking for one or two counselors, two trip leaders, and a few support staff. The quality of applicants that we've seen this off season has been tremendous which bodes well for another great summer. Andy and I spent most of the month of February on the road and a big part of those travels was to college campuses across the Midwest. Our visits (in order) included Michigan State University, Eastern Michigan University, University of Michigan, University of Wisconsin-Stevens Point, University of Wisconsin-Lacrosse, University of Illinois, Indiana University and Purdue University. We will have guys on our staff from each of these schools! As we looked down the list of our new staff we are able to say that we have met every new counselor on face to face, or hired them through an International agency, whose hiring process requires an in-person interview. Since there won't be a new Siren for a few weeks, here is an update of staff that have been hired since the last newsletter. We'll have more details about them in the May Siren. Returning Staff: Junior Counselor Michael Eichner, Trip Leader Caleb Klima, and returning after absences of a few years, Senior Counselors Charles Eisner (Univ of AZ) and Joe Goldberg (Brown University). New Staff: Senior Counselors Thomas Anderson (United Kingdom), Paul Doher (Mich State), Timothy Edwards (United Kingdom), Scott Fortune (Purdue), Jared Gray (New Zealand), Richard Roberts (Australia), Malcolm Russell (United Kingdom), Brant Schrage (Univ of IL), John Sheehan (Univ of IL), and Ben Shoesmith (New Zealand). Leb, Sue, Andy and I know how important it is to put together the best staff possible. These are the guys on the front line, dedicating their summer to being role models and giving our campers an amazing experience.